Where is high-tech headed? Read the predictions. 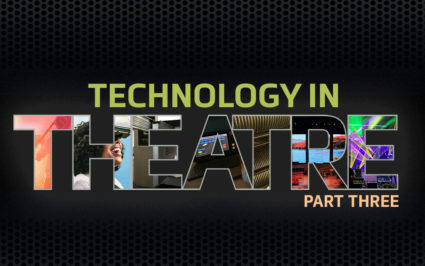 Welcome to the finale in our three-part blog series on technology in the performing arts. We’ve saved the best for last: Where high-tech is headed. Q: Let’s get right to it. What are your predictions for how technology will further impact the performing arts? What’s next? ED – For motorized and automated rigging hoists and their motion control systems, the increased safety and decreasing cost offered by technology is likely to result in increasing numbers of the systems specified for use in academic and professional production environments, as automation continues to develop. Also, look for more systems that facilitate the change of the visual and acoustical environments in the theatrical space with the simple touch of a button. This level of versatility can allow venues to rent their theatres for two, and even three, events per day. Imagine running a children’s play with the theatre seating in the morning, an art exhibit on a flat floor during the afternoon, and finally, a jazz show with cabaret seating that very same evening. The possibilities are ever expanding. JIM – I predict there will be more intertwined technologies (lighting, rigging, acoustic shells, active acoustics, staging, seating). Also, I think there will be more of the larger and more sophisticated venues. For example, “mega churches” have taken the place of many neighborhood houses of worship. MIKE – I see more automated rigging or a combination with manual rigging, and active acoustic systems. I actually think active acoustics is still in its infancy in the performing arts space. Also, whether it’s a new-build or renovation, there will be more early design collaboration to maximizing venue versatility. PATRICK – In terms of rigging, manual will continue to dominate the touring venues and motorized rigging will take over educational venues. More and more productions at every level will incorporate stage automation. JOSH – A lot of sophisticated venues want to hold on to manual rigging, because of its capability and flexibility, and because those venues have operators who can utilize the full range of functionality. Others want to simplify their operations and potentially reduce staff, so they want only automated rigging. There is also the perception among some that automation is inherently safer. The soul of live performance is the connection created between people. But it’s getting harder and harder to make real human connections in real life. People’s sense of community is becoming less physical and tangible and much more virtual, and that will continue. This makes live performance simultaneously more important as a remaining shared physical experience and more endangered because there is a growing sense that virtual communal experiences are equivalent to actual communal experiences. Trends of democratizing art tools [people no longer need to rely as much on special equipment to express themselves artistically or to disseminate their art] will increase and continue to affect performing arts in some way. Q: How will technology trends impact artists, audiences and owners? MIKE – More than ever, to stay competitive, they’ll have to stay open to change and adapt to it. ED – They must continually evolve with the changing times, just as they have throughout the history of the theatre. Theatre goers (and users) will continue to demand the incorporation of new technologies that allow them to experience the newest, most provocative productions required to challenge perception, arouse the emotions, stimulate thought and provoke their belief systems. This always has been – and will continue to be – the nature of the theatrical experience. PATRICK – Technology will enable bigger effects with fewer people involved. Q: How is Wenger and J.R. Clancy helping customers stay competitive and prepare for the predicted trends? JIM – Our customers look to us for technology recommendations. Many want design/build solutions from a single, responsible vendor like Wenger and J.R. Clancy who are equipped to put things together and make it all work seamlessly. MIKE – We’ll continue to provide custom products and adapt different delivery methods on projects. Adapting to change can be hard, and the pace of technological innovation in the performing arts can make anyone feel like Sisyphus. There are also realities, like budgets and return-on-investment. Josh Grossman gives those challenges some perspective. Visit Wenger to see how one company can help your venues resonate with viewers today and into the future, using the broadest array of innovative, high-quality products and services for your performing arts spaces.